I’m 100% an urbanite again. Amazing what that does to one’s psychological state. Over the next few weeks I’ll be posting a few of pics related to my new commute. Maybe if I’m luck I’ll even be able to start posting regularly again! 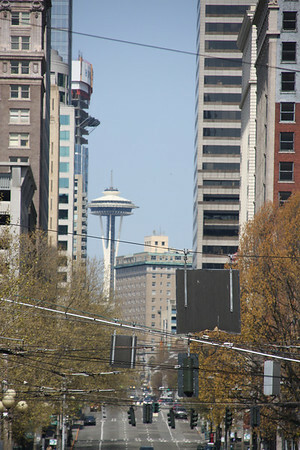 For now I simply am posting this photo I have from a couple years ago, while simply visiting Seattle and wondering what it would be like to live here. 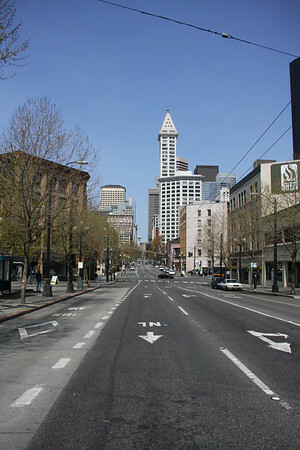 Today I jumped aboard King County Metro Bus #26 headed south bound through downtown Seattle to King Street Station. At this time of the morning, 6:19am, the streets are tranquil and oddly lit with the night lights. As the bus pulls up at 6:29am, 7 minutes late with 6 passengers on board, I swipe my ORCA card to pay the fare and take a seat toward the back. 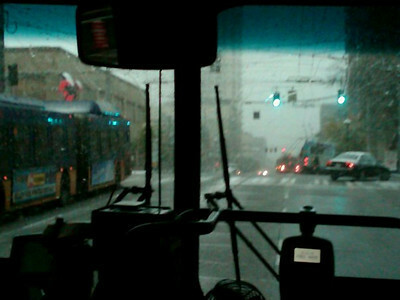 The bus rolls through the wet from rain streets. The street and building lights glaring like golden decorations all along. Barely a soul moves, except for the rare early riser and oddball bum or transient. A person walking down one street howls some nonsense, as his sanity cracks. The sky is overcast gray, one can tell even with darkness still caressing the early morning. I get off the bus in the old town Pioneer Square are one block north of King Street Station. I’m now running pretty late compared to my intended arrival time. I’m glad I decided to get the bus just before the one that would theoretically get me to the station on time. So now instead of early I’m just barely on time. 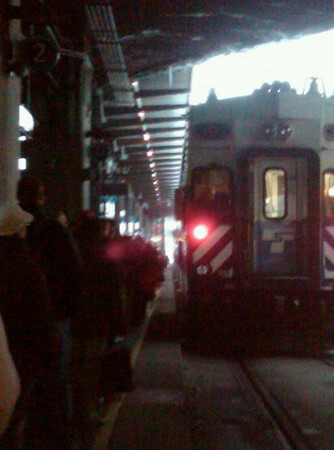 I make no dally and attain my tickets from the ticket clerk and stand in the line to get a seat assignment. After standing in the line of the century old process of seat assignments, I text my lady after realizing I failed to provide a wake up call. She’s forgiving thankfully and wishes me a good trip. I bid a good day to her. With a steady walk I roll the dice to get a good cappuccino and croissant from Zeitgeist 2 blocks from the station. I arrive, as always when they’ve just opened there are only a few people inside and nobody is in line. I walk right up and order. A few minutes later the candid young lady working provides me a cap and ham and cheese croissant. I’m set, and back to the station I go. As I walk into the station I literally beeline straight through and onto the train. Again, dice rolled and perfection in timing. I’ve made the train with a decent bit of quality food and drink for the trip. I sit down in car 8, seat 15, and sip on my cap and nibble a bit on the croissant. The coffee is delicious, an absolutely spectacular brew. The croissant has an elegant, light suppleness to it. With an almost sweet aftertaste, a perfect complement to the cappuccino. We depart perfectly on time at 7:30am. The flanged wheel is again moving me in luxury to my destination. The plush leather chair, not even business class but mere simple peasant class, comforts me as the breaking night gives way to the sun that can’t be seen. The train is a perfect temperature today, people being quite at this time of the morning. I lean back knowing that the last decade of my life, ridding myself of automobile, putting myself into walkable communities, and throwing the suburban nonsense into the trash has been the right decision. This ease, simple and elegant, down to earth and real, sustainable in so many ways, tasteful and subtle just brings a smile as we roll smoothly on through southern Seattle. Every few minutes though, when leaving Tacoma and Olympia we go through the desolate and lifeless suburbia where mediocrity screams out as the leading mindset. Not a soul risen or working toward a goal. Providing souls for urban jobs and imitation of the rural life. However leaching off the wealth of the urban life and mocking the rural life, it holds no place anymore with the death knell of the cold war. It just drags upon American society with vast auto dependency and no real war survival need. Having bred cursed mentalities of land entitlement and assumed rights to jobs – suburbia is an odd and crass place. But I digress, the beauty of the rural land surpasses the suburban ideas that frustrate me at the moment. About 30 minutes out of Tacoma we roll through the beautiful nature, disturbing barely a soul as we traverse the country side. The trees along both sides of the tracks break the frequent farms and fields. Green is intense with a speckle of orange and yellow leaves among the trees. The rural residences of the red counties caressing the land to feed the blue counties full or urban people. The parallels of America that make this country; urban and rural landscapes. 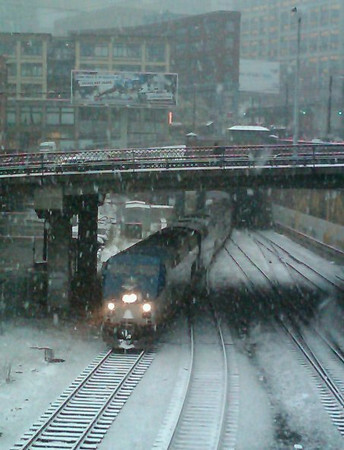 With these thoughts of the beauty of rail travel, I bid this entry fini.